Every day, tens of thousands of people switch from Microsoft Outlook® and other client-based software to Google Apps. To make the transition as smooth as possible, we thought we’d share some tips on using Gmail. Emails rarely come just one at a time; they’re usually part of a larger exchange. Gmail helps you manage messages more efficiently by grouping related emails into conversations. Conversations are a collection of messages with the same subject line and other similarities. When you click to read a conversation, you'll see all of the back-and-forth email responses that happen over the course of the entire email conversation. This makes it easier to follow the full context of a conversation, and keeps your inbox less cluttered and more organized. If you prefer a more traditional view of your Inbox, you can always turn off Conversation view so that all emails arrive individually. The average corporate inbox is only 300MB, which means too many people are forced to spend way too much time managing their inbox -- deciding which email to keep, and deleting the rest. With 25GB of storage, you probably won’t ever need to delete an email again because of storage limitations. And if you thrive on clearing your inbox, simply archive your emails to clear the clutter. They’re still fully searchable in an instant! You may be accustomed to sorting email to find saved messages, which is a pretty limited way to find information because you usually know what you’re looking for. Gmail uses the power of search to help you quickly find what you want. You can even use advanced search operators to search by sender, date, attachment or a variety of other attributes. Try it and you'll find some of the qualities that Google.com is known for: great accuracy and really fast search results. Search is particularly more effective than sorting when you’re looking through multiple gigabytes of email! While you won't find folders in Gmail, labels give you even more flexibility to organize your email. You can’t put an email into multiple folders, but you can apply multiple labels to the same message, which makes it easy to manage information that may fall into more than one category. These days you’re probably almost always connected to the Internet. But in those increasingly rare moments when you’re not, you can still access Gmail. When you’re offline, you can work in your browser to compose messages, search, organize mail, and do all of the things you're used to doing while accessing your email online. Any messages you send while offline will be placed in your outbox and automatically sent the next time Gmail detects a connection. To enable offline Gmail, go to the ‘offline’ tab in Settings, select ‘Enable’ and then save changes. As a web application, Gmail can be updated and improved without the trouble of purchasing, downloading and installing updates. This means Gmail will continually offer new functionality to help you be even more productive, like Priority Inbox, integrated voice and video chat, and labs such as Apps Search and Desktop Notifications. To stay current on new features, we encourage you to subscribe to our RSS feed for updates to the Google Apps suite. We hope you enjoy the experience we offer -- we believe that ultimately, a fully-searchable, delete-nothing inbox makes for happy, productive people. But if you’re still not quite ready to use Gmail’s web interface, you can keep using Outlook or other clients of your choice. For more tips, check out our detailed transition documentation, and let us know what else we can do to make your move to Gmail easier in the comments below. to reflect any new services he offers. He might add a new video or update his business description. The listing also helps him market his business niche - laser procedures to help patients avoid painful gum surgery. Read more. You can update your Places account at any time by signing in at http://google.com/places with your email address and password. Hope you had a great summer and are ready to jump into fall! Here are a few tips to further engage with your customers, and we've also shared the experience of Dr. Jeffrey Prager, whose use of Google Places to connect with potential clients for his dental practice sheds light on how other businesses and professional services can achieve similar success. 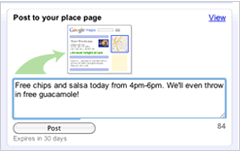 Connect with your customers through Place page posts. These 160-character posts allow you to share a short update or special with users. Check out some examples and sign in now to write a quick post! See more examples of updates and sign in now to edit your page. Through Google Places, Dr. Jeffrey Prager's Bellinghamsmiles.com Dental Care has a continual influx of new customers, reduced marketing costs, and a high ROI. As his practice continues to evolve, he updates his Place page to reflect any new services he offers. He might add a new video or update his business description. The listing also helps him market his business niche - laser procedures to help patients avoid painful gum surgery. Read more. Last week, YouTube and SEMPO hosted a social marketing panel, "How to run a successful social campaign," for SEMPO's San Francisco and Los Angeles working groups. The panel featured speakers from YouTube, Facebook, Twitter, and Athena East, and highlighted the unique products available to marketers, and best practices for executing measurable, impactful social advertising strategies. Derek Gordon of Yield Software was there, and shared what he learned in today's Mediapost Search Insider column. Click here for his complete update. In 2000, Antoine Assi founded Middle Eastern export website www.aldoukan.com—it was one of the first e-commerce business in the Middle East. He was just 20 years old and he made time to develop the business in between computer science classes at his university. He needed a way to advertise his website from the comfort of his own dorm room, so he decided to test out Google AdWords. His friends didn’t believe him when Antoine said he was going to sell and advertise traditional Middle Eastern foods and goods online. However, by 2004, his business had grown so rapidly that he decided to take leave from school to run it full-time. 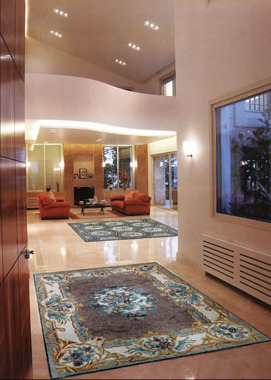 He then started his second company, www.mosaicmarble.com, which sells handcut decorative tiles online internationally. Antoine believed there was a gap in the mosaic market and he wanted to share these artistic and historic decorations abroad. He knew there was a market for these tiles internationally—he just didn’t quite know where the opportunity existed. To identify these international growth opportunities, Antoine built on his knowledge of AdWords: He ran several AdWords campaigns, each targeted at the location and language of the test country. From there, Antoine measured sales and percentage of website traffic from each country and campaign. He ended campaigns for countries with low sales volume and invested in campaigns for countries with higher sales volume and greater return on investment. Where he saw steady product sales, Antoine even had the company website translated into the language of the successful host country. As you can imagine, translating the site to the language of a country in which he’d already seen success only further promoted sales in that location. Mosaic Marble quickly grew from two employees and eight artists to more than 40 employees and 120 artists. And the company’s website is now available in seven languages: Arabic, English, Finnish, German, Italian, Portuguese and French. Editor’s note: Over the past couple months, thousands of businesses have added their Gone Google story to our community map and even more have used the Go Google cloud calculator to test drive life in the cloud. To highlight some of these companies’ Gone Google stories, we decided to talk to Google Apps customers across the United States. Check back each week to see which state we visit next. To learn more about other organizations that have gone Google and share your story, visit our community map. “It’s always a good day to ‘gofer’ ice cream,” according to Jay Ragusa, President of Gofer Ice Cream. Jay has opened five stores throughout Connecticut that provide high quality ice cream and unique treats such as razzles, smoothies, hand dipped ice cream, and soft serve ice cream with a flavor twist. Jay relies on Google Apps to keep his business running, and today he shares how it has helped him and his staff work more efficiently. “Between our online accounting software and the use of Google Apps, which has become an integral part of our daily operations, we are gradually putting the entire company in the cloud. Google Sites, part of the Google Apps suite, is used to create specific pages on our external website (gofericecream.com) so we can easily edit content without the use of a webmaster. Internally, we built multiple intranet sites including the Gofer Network where store managers and franchisees communicate, organize, and operate their part of the company. The Gofer Crew Portal is a site designed for the staff to access information such as contact numbers, store schedules and the internal Gofer Blog, and submit time card exceptions. We rely heavily on Google Docs to update manuals, recipes, and employee schedules all of which are posted on the Gofer Network for store managers to access and share with employees at each store. For financial reporting, we created custom Google forms to efficiently collect data on point-of-sale purchases every night — store managers input their sales numbers into the form and everything is automatically populated in my spreadsheets. The forms are a great way to get the data quickly without having to expose sensitive revenue information across all the stores. The world is a big place that’s constantly changing, so in digitally replicating it on Google Maps, you can imagine how much information we’re working with. We get data for Google Maps from a number of sources, including third party providers, business owners and users like yourself. And while for the most part, our algorithms do a great job of accurately reflecting the real world on the map, there are some instances when we get it wrong. If you notice something that’s incorrect on Google Maps, chances are it’s either an issue with our map data - things like city and road names - or with our business listing data. We have a number of simple tools that make it easy for you to correct or report any issues so that we can get the maps right. Your assistance helps us provide the most accurate and up-to-date maps possible, so you and other Google Maps users can find what you’re looking for and be on your way. Use the Report a Problem tool in the U.S. and Canada, most easily accessible by right-clicking on the map or clicking the link on the bottom right-hand-side of the map. If anything with our map data is wrong, such as a road being renamed or a new highway on-ramp opening up, please submit a report. We work hard to fix the map based on user submissions, and try to resolve these issues as fast as we can. Countries outside the U.S. and Canada should contact the Google Maps data provider to correct the information. If you see incorrect information appearing on Google Maps listings in the U.S. (and many more countries), you can make updates to listings directly on Google Maps. Once we've reviewed your edits, updates to the listing will go live within several hours. If you are the business owner but have yet to claim your listing, see below for more information about Google Places. The best way to report incorrect information is to use the “Report a Problem” tool, where available. Report a Problem allows you to specify exactly what is incorrect about a listing. Once these user-submitted reports are reviewed, updates to the listing will go live in a few weeks. If you’re a business owner, you should also claim your Google Places listing so that you can edit and update the listing that appears on Google, Google Maps and GOOG-411. Verifying your free business listing allows you to not only ensure that accurate information appears on the Place page for your business, but also enhance your online presence by adding photos, videos and even real-time updates like weekly specials to your Place page. 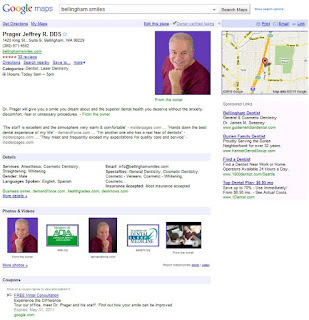 Claim your Google Places listing by adding it at http://www.google.com/places or by clicking “Business Owner?” on the Place page for your business. Verify your listing by PIN (postcard or phone). Within an hour, click the “See your listing on Google Maps” link in your account to see your listing’s Place page. If incorrect information is appearing in your listing, there are a number of different ways to let us know and get the information corrected. Today we’re announcing the first AdWords Train & Gain challenge. You’ve asked us how to improve the performance of your AdWords account, so we’ve put together a series of simple steps to help you become more successful online. Sign up for the AdWords Train & Gain challenge starting October 4th. You'll receive a weekly list of simple steps for improving your AdWords account. Sign into your account twice a week and take the suggested actions on how to better manage your account. At the end of four weeks, you’ll be armed with many different ways to improve your AdWords account. If you complete all the steps and answer a short questionnaire to let us know what you’ve learned, you could win an Android Phone or a trip to meet with an AdWords consultant in Sydney, Australia for you and a colleague. Improve ad text: Stand out from your competition by writing ads that highlight your most competitive features (low price, special services, free delivery, etc). Use negative keywords: Specify which search terms you don’t want your ad to appear on. This will help you keep costs down because it prevents clicks from people looking for things you don’t offer. Track sales and leads: See where your ad spend is working best and focus your money on the efforts that are generating business. This challenge doesn’t take up a lot of time and it can make a big difference for your business. Learn more and see the official rules for details about the challenge, who is eligible to compete and how we’re selecting winners. Terms and conditions can be found here. Also, if you’d like to learn more about your AdWords account, check out our brand new AdWords Small Business Center, which we announced in last week’s post. The site is a one-stop shop for small and medium businesses. It allows visitors to explore beginner, intermediate or advanced AdWords topics and connects you to the latest AdWords news and best practices. Cloud computing is about making your information easily accessible from anywhere, on any device. Until today, organizations looking to secure their information beyond a password have faced costs and complexities that prevented many of them from using stronger security technologies. Today we are changing that with the introduction of a more secure sign-in capability for Google Apps accounts that significantly increases the security of the cloud: Two-step verification. For the first time, we’re making it possible for organizations large and small to use this technology in just a few clicks for free. In the coming months, we’ll also be offering this same security to our hundreds of millions of individual Google users. Two-step verification is easy to set up, manage and use. When enabled by an administrator, it requires two means of identification to sign in to a Google Apps account, something you know: a password, and something you have: a mobile phone. It doesn’t require any special tokens or devices. After entering your password, a verification code is sent to your mobile phone via SMS or generated on an application you can install on your Android, BlackBerry or iPhone (coming soon) device. This makes it much more likely that you’re the only one accessing your data: even if someone has stolen your password, they'll need more than that to access your account. You can also indicate when you're using a computer you trust and don't want to be asked for a verification code from that machine in the future. Two-step verification is built on an open standard designed to allow integration with other vendors’ authentication technologies in the future. We are also open sourcing our mobile authentication app so that companies can customize it as they see fit. Two-step verification continues Google’s stream of security innovation. In early 2009, we added the ability to view password strength and set minimum password length requirements for Google Apps accounts. Later in the year we were the first to provide HTTPS encryption to millions of users, and in 2010 Google Apps was the first cloud messaging and collaboration service to gain US government security certification. Administrators for Google Apps Premier, Education, and Government Editions can activate Two-step verification from the Admin Control Panel now, and Standard Edition customers will be able to access it in the months ahead. , 98 percent of Canadian businesses are considered small, and they employ close to half the country’s private sector workforce. Given that metric, it's obvious that a healthy and vibrant small business sector is essential to Canada’s economic growth. With the proliferation of the Internet, it’s easier than ever for entrepreneurs and small business owners like you to reach new customers, promote your products, and access new markets in ways that only large corporations could manage in the past. For example, powerful and intuitive online applications such Gmail, Google Calendar and Google Docs can help you slash IT costs and enable your employees to collaborate more effectively. To further this movement towards taking advantage of online resources, we're launching a partnership with The Globe and Mail to help Canadian small business owners and entrepreneurs expand their Web presence and use the Internet to boost sales and long-term growth. 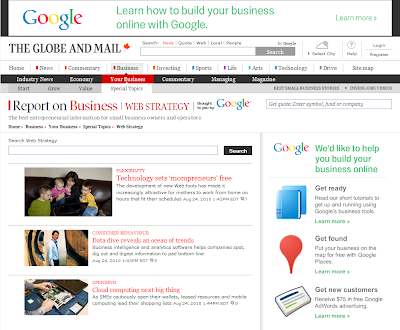 The Web Strategy section on The Globe and Mail website will bring together Google's knowledge of business in an online environment with The Globe and Mail’s insight into strategy and economic issues. The site will feature information and stories for small businesses, as well as provide tutorials about how to get started with Google’s many business tools, including Google Places and AdWords. In the coming weeks, the Web Strategy page will explore topics such as how the Internet can transform the ways you reach new customers and how you operate your business. If you have suggestions or questions, we would love to hear them. Click here to use Google Moderator and start sharing your ideas with us. According to Statistics Canada, 98 percent of Canadian businesses are considered small, and they employ close to half the country’s private sector workforce. Given that metric, it's obvious that a healthy and vibrant small business sector is essential to Canada’s economic growth. Editor’s note: Over the past couple months, thousands of businesses have added their Gone Google story to our community map and even more have used the Go Google cloud calculator to test drive life in the cloud. To highlight some of these companies’ Gone Google stories, we decided to talk to Google Apps customers across the United States. To learn more about other organizations that have gone Google and share your story, visit our community map. Based in Minnesota, Brian Short is a Registered Nurse, as well as the Founder and CEO of allnurses.com, one of the largest online nursing communities with more than 430,000 members. Brian started the website as a hobby in 1995 when he was attending nursing school. He’d search online for relevant nursing information without success — it was easier to find websites on planting trees or feeding babies than reliable sources on clinical nursing. So what started out as a website with a few links spawned into an online community and central hub of nursing information. The website now includes blogs, articles, and discussion forums across all specialities, with more than nine million global page views a month and 2,500 new posts submitted by members every day. To support this growth, Brian shares how he’s using Google Apps to remove location barriers and increase process efficiencies. “I started out with my own internal email servers which were clunky and hard to manage. I was also dissatisfied with the accompanying email client. It would take forever to search, find, and organize all my email, and I was constantly deleting emails to avoid slowing down my machine. When I learned about Google Apps it was an easy decision to switch. I love the concept of cloud computing and being able to access all my applications through a browser. Now, I've been using Google Apps for several years and it has helped the company tremendously. There are over 30 staff members scattered throughout the US and internationally. Google Apps allows us to communicate with ease by using instant messaging, email, shared calendars, and online documents. I’ve also used Google forms to support marketing initiatives that increase awareness of allnurses.com. In one of the print ads, I included a URL that leads to a landing page with a form embedded in it. Educators can use the form to request pens for their nursing students. It’s a good way to engage with my audience and scale a manual process. Incorporating data from both user search behavior and the performance of your own account, the Opportunities tab is an excellent tool for garnering suggestions that can help you to improve targeting, expand your reach or increase the effectiveness of your marketing spend. To make improving your campaigns as easy as possible, the Opportunities tab lets you review ideas and apply them directly to your account. You can also save these ideas as “pending changes” in case you want to think about them and add them later. The ideas shown on the tab are generated by our system just for your account, so look them over carefully before you try them. Some may not fit your own needs, but some may help to improve your campaign performance. Automatic Bidding is the easiest of the AdWords bidding options. With automatic bidding, the AdWords system automatically adjusts your maximum cost-per-click (CPC) bids on your behalf. You still set your daily budget, but rather than specifying individual bids for ad groups, keywords, or placements, the AdWords system actively seeks out the most clicks possible within the budget you set. Enhanced CPC is an easy-to-use automatic bid management tool intended for advertisers already using conversion tracking who are looking to turbo-charge their return on investment. The tool automatically adjusts your Max CPC bid each time your ad is shown in order to maximize the likelihood of your ad will converting. As a result, your ad should receive more conversions while maintaining or reducing your overall cost-per-conversion. To learn more about Enhanced CPC, you can visit our help center or watch a short video. You can create custom alerts in your AdWords account so you're automatically notified when certain behaviors and/or changes occur within your campaigns and ad groups. This enables you to constantly track increases or decreases in the metrics that matter to you or metrics that have reached a certain threshold you set. To learn more about this feature, please visit our help center. For even more tips for saving time and improving AdWords performance, please visit our new Google AdWords Small Business Center. As a small business, you may find that investing in marketing can be a catch-22; while you are looking to grow your business, your time is limited and budgets are tight. While AdWords has always been about making advertising as measurable as possible, we are well aware that time is money - especially when you are a small company. So, in an effort to help you preserve your most precious asset, we wanted to share a few of tools we’ve developed as part of our effort to make account management less time-intensive. Today we’re announcing the second annual TV for All contest, where your business has the opportunity to win $25,000 in national advertising with Google TV Ads and online video partner sites, including YouTube. We originally launched this contest last year and received nearly 250 submissions. Three winners, including Owners.com, won free TV media through Google and successfully extended their brands across the nation. Now it’s your turn! Entering is easy: simply create a video ad for your business, upload it to YouTube and submit it to our TV for All YouTube Channel between September 15th and October 12th. If you don't have a video ad or the tools to create one, professional tools by SpotMixer will be available for free to help you make a polished ad in just minutes. Three winners whose ads best exemplify creativity and a compelling message will receive $25K, $15K, or $10K in national TV and online video advertising using Google AdWords. If you've never promoted your business using TV and video, the TV for All contest is your chance to get started. For more details and to enter the contest, visit www.youtube.com/tvforall. - our online advertising offering available through Google Places - we’ve been acutely aware of the need to create something simple, easy, fast and effective for you and the potential customers looking for you online. You may have heard about our recent promotion inviting business owners who are new to Google Tags to take advantage of a free 30-day trial. That trial is still going on, and we’re also excited to announce that we’ve streamlined the sign-up process into three easy steps. Now, it’s even easier to set up the little yellow tag in your business listing and start attracting more local customers for your business! 2. Select one of the seven available tag types, and follow the prompts. For example, if you choose a post tag, enter a note about the the unique aspect of your business that you want to highlight in the empty box. 3. Enter your credit card information. If you’ve never tried Google Tags before and are eligible for the free trial, your first month will be free! Business owners can typically complete the sign-up process in less than five minutes. With that speed, you can get back to all the other tasks that require your attention to keep growing your success! We’re thrilled that thousands of local businesses have already been using Google Tags to attract and connect with local customers since it became available throughout the U.S. this summer. And if you’re a business owner that hasn’t yet claimed your listing in Google Places, learn more about that simple process, and then follow the same three-step tags process. This new sign-up flow is one the many features we’re working on to make the product even more efficient. 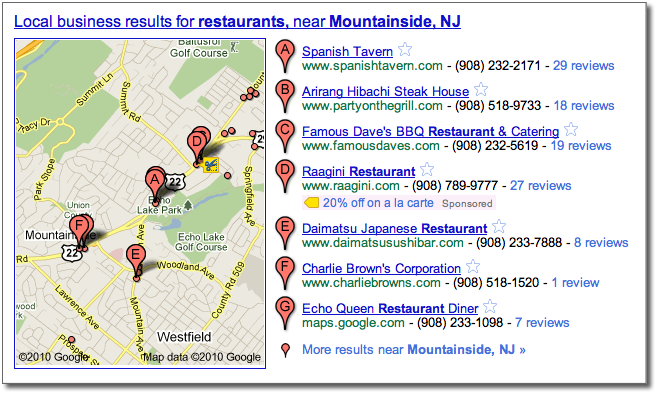 As a reminder, Google Tags is usually offered for a $25 flat monthly fee, and does not affect the ranking of the business listings on Google.com or Google Maps. Try it out today! We get it: as a local business owner, you’re busy. Really busy. That’s why throughout the development of Google Tags - our online advertising offering available through Google Places - we’ve been acutely aware of the need to create something simple, easy, fast and effective for you and the potential customers looking for you online. We all have a dream. America’s 25 million small business owners are making their dreams happen. But it’s never easy. For E.C. Hundley, his dream had four wheels, an engine, and a smooth ride. As the proprietor of Everything Carts in Martinsville, Va., E.C. built a business that custom assembles souped-up, street-legal golf carts. He also sells cart accessories online, and his business now employs eight people. With your dream, some hard work, guile and a penchant for online marketing, you can do something like this, too. Let’s see how E.C. is using YouTube to build his business. Did you get your business online from the start? Oddly enough, we started out as a local retail store, and we never thought about taking our business online. After the first 8 months, we were going broke with just one employee, and I figured we had to do something if we were going to survive. So you took your business online just to keep it alive. Yes. At that point we had maybe $1,500 in inventory sitting on the shelf, so we started putting some of it on eBay. We then got with a friend who’s a web designer, and he built our website. Since then we have revamped the site about four times to make it friendly for our customers. It saved our business. How much of your business comes from people finding you on the web, compared to other channels? Our direct web activity is about 70% of our sales. Most of the rest is via telephone, and we also promote our business via a print catalog. Tell us about your YouTube channel. What kind of videos do you make, and how do they help your customers? I help people with installation of the products we sell. Our call volume had gotten really high on some of our products, so helping people over the phone was taking a lot of time. Then I remembered watching a Photoshop tutorial on YouTube, and I thought to myself this is the answer to our problem. So we started shooting a few how-to videos and posted them on our YouTube channel, and soon those calls stopped completely. Do the videos help you sell more, too? Yes. The videos also help us earn new business, because our customers can see that we know the products we sell, and they can buy with confidence. What are your future plans for online video? With the success we’ve had with the few videos we have done, we have now built a studio just for shooting how-to videos. This way the customer can see how the products are installed and get a better idea of how it is going to look. One of the toughest parts of selling a product online is that the customer usually just gets to see a picture of what they’re interested in. With video they get a better idea of the real look and size. It is the closest thing you can get to seeing, touching, feeling the product. That’s the real power of video, isn’t it? How hard was it to get started building a YouTube channel? It was the easiest Internet task we had ever done. It’s pretty easy and inexpensive to make good-looking videos today, too. What advice would you have for other business owners or managers who are considering YouTube as a marketing channel? The main advantage of producing online videos, especially for an online business, is it makes your business real. Customers need to see that your company has real people behind the website. Eric Meyerson, Video Business Marketing Lead recently watched "1981 primitive Internet report on KRON"
Are you eager to optimise your Conversion Rate, but feel a little bit overwhelmed by all of the tools available to help you? Today we're delighted to introduce Improving Online Conversions for Dummies. We have just released a simple, easy to follow mini book, in conjunction with John Wiley Publications, to help you get a better grasp of the conversion improvement tools offered by Google. Improving Online Conversions for Dummies explains how you can make sure your ads show on searches that are most likely to convert into sales. Understand which ad clicks and impressions lead to conversions, better apportion your marketing spend and even develop your own conversion attribution model. Discover the secrets to getting more bang for your buck with this ebook. Dentists primarily rely on word-of-mouth referrals from existing patients, but they’re also open to welcoming new patients from other sources. 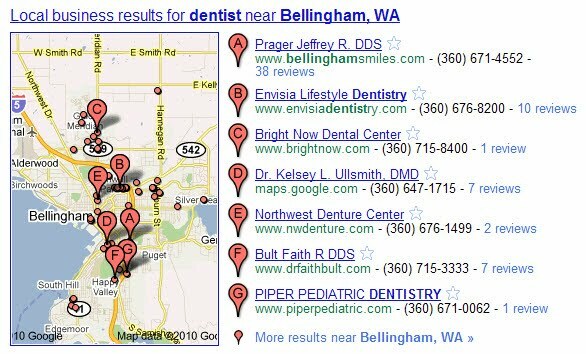 That’s why Dr. Prager was intrigued when one of his patients suggested that he check out Google Places as a way to build an online presence for his dental care practice, Bellingham Smiles. 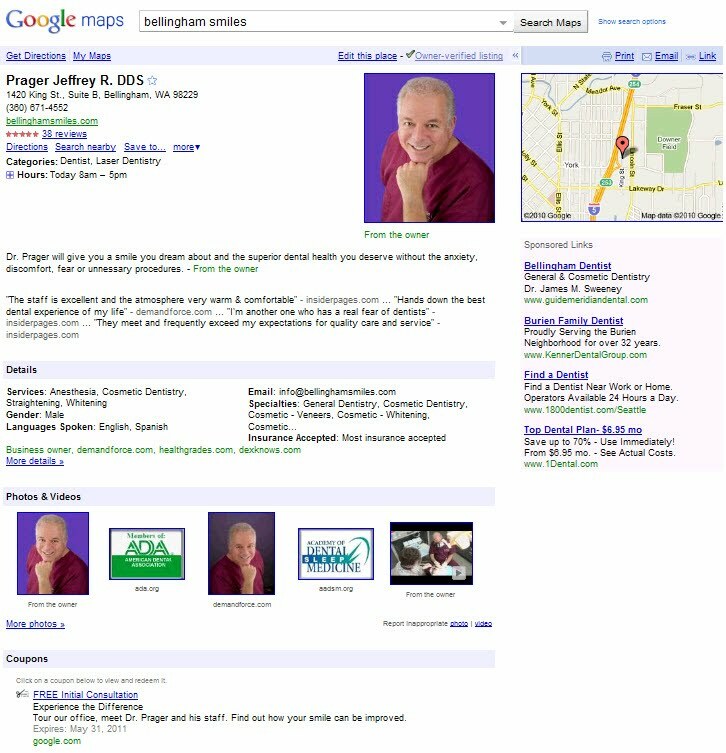 Realizing that he could have his business listing appear for free when people searched on Google.com or Google Maps for services like “dentist in bellingham,” Dr. Prager claimed his listing and built out the Place page for his business. As his practice continues to evolve, he updates the Place page for Bellingham Smiles to reflect new treatments and promotional offers. For example, from time to time, he adds a new video or updates his business description. “It’s best to stay on top of it and modify it as you add new services and any new emphasis in your practice,” he says. In many cases, patients come to him via his Place page in hopes that he can save a tooth that has been targeted for extraction by another dentist. It also helps him publicize his niche expertise in laser procedures that help patients avoid painful gum surgery. 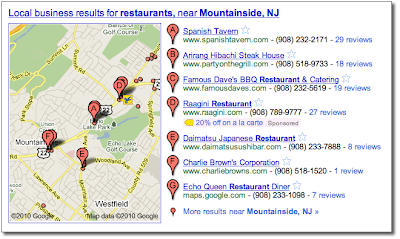 To create a Google Places account for your business, visit www.google.com/places. A dentist by trade but an entrepreneur at heart, Dr. Jeffrey Prager has tried many tactics — including television, radio, newspaper inserts, phone book ads and direct mail — to attract new patients for his Bellingham, Washington-based dental practice. As the former VP of Technology at a major financial services firm, Ray Malone has spent most of his career focused on business intelligence, data warehousing, and development of web-based applications. So, when his wife, Tina Malone, decided to start a new business out of their home in West Virginia, Ray naturally helped her pick out the technology that best suited her needs. Today, with Ray’s help, Tina is running MSaven.com, a successful marketing business that provides companies with text message marketing, print advertising, and the ability to offer online coupons. The technology that powers the company is an important part of its success, and Ray shares with us how Google Apps and Google App Engine play a pivotal role. “In 2008, my wife Tina came up with the idea for MSaven.com, but there was a catch – she expected me to set up our IT infrastructure with little to no money. I had been using Gmail and almost every other Google product for a long time so it was an easy decision to use Google to build the business. Now, our entire operation runs using both Google Apps and Google App Engine, and the combination of performance and scalability has been awesome. We use Google Apps for everything from emailing to creating online documents and spreadsheets. I recently used a Google spreadsheet to create a financial calculator showing advertisers how much they could potentially make with our firm – I shared the spreadsheet with a prospective advertiser and walked him through it over the phone. We were both able to tweak specific inputs on the spreadsheet and see the results in real-time. It was a powerful way to communicate without having to be in the same room. I’m constantly using Gmail and Google Calendar, and access them extensively from my Android-powered device. Both allow me to coordinate with our sales reps and contractors. Some of our contractors are located internationally so the Talk feature, integrated in Gmail, has been the primary communication channel. With Google App Engine, I’ve built our entire web application. Python was a new language for us, but within a few months we were building dynamic content and connecting to vendor systems. Here’s an example of how it works – when a consumer sends us a text message requesting a coupon, we connect to the vendor’s system through an API (this is the vendor that is providing the coupon), and the right coupon is dynamically generated and sent back. If this is the second time the consumer has contacted us, a different coupon or message is sent back. All of the logic, and the ability to generate and send coupons is built with Google App Engine. Today we're happy to announce the launch of a new website - the AdWords Small Business Center. Many of you asked for an AdWords resource focused on learning and the top tips for small and medium businesses, and we listened. This new central learning hub allows you to share AdWords best practices and provides the key information you need to know to run a successful AdWords account. Whether you're new to AdWords or not, the AdWords Small Business Center allows you to explore insightful topics as a beginner, intermediate, or advanced user. It covers everything from strategies for writing great ads to ways to improve your website, all in an easy-to-navigate format. Stay in the loop by visiting the Inside AdWords blog right from this new site. It makes it easy to read about the latest trends and product updates and use them to grow your business. Want to discuss one of the tips on the site with another small business owner? Visit our recently launched AdWords Small Business Corner, a discussion forum in which other small and medium business owners who use AdWords exchange advice on the strategies that have helped them grow their businesses. Use it to share your AdWords experience or simply learn from others. We hope you find the AdWords Small Business Center useful. Check it out today! In the coming weeks, make sure you're also on the lookout for our blog post on AdWords Train & Gain, a challenge to help you become more successful with your online advertising. We'll be giving away cool prizes like Android phones and, for one lucky winner, a trip to Sydney, Australia for a free consultation with an AdWords expert. Sign up now or find out more details and official rules. To keep you updated with the latest industry news, insights, and best practices, we’d like to let you know about an upcoming educational opportunity held in partnership with the Interactive Advertising Bureau (IAB). On September 14, 2010, the Google AdSense team will be co-hosting a webinar with the IAB Long Tail Alliance to cover “What You Need to Know about AdSense.” Members from the AdSense team will cover tips and best practices to help you maximize your AdSense revenue. If you’d like access to future IAB Long Tail Alliance seminars and events, you can become an IAB Long Tail Alliance member. Membership provides you with access to an ongoing series of web seminars, resources, and events that are all specifically designed for small and growing publishers. Register using the promotional code GOOGLELTA to receive $100 off the price of a membership. This week we head to Maryland where StraighterLine is trying to level the playing field in education. StraighterLine’s mission is to disrupt the high cost of online education courses by directly partnering with colleges and vetting courses through national clearing houses to provide students with the lowest cost options for taking courses and earning credits online. Joseph Thibault, Course Manager at StraighterLine, shares their story. When we jumped into the world of online education head-first, our small staff was spread across the US. As a result, we decided to use Google Apps because of its ability to facilitate this virtual office. The ability to share docs, communicate synchronously, and work collaboratively on docs provided us with a quick and easy way to improve courses, our brand and website. Google Apps has sped up the rate at which we collect information and communicate internally and with students. By using forms in Google Docs we can easily collect survey data from new students to help us focus our marketing efforts. We also use forms to collect course evaluations so that we can improve our courses and services quickly. Creating a form in Docs only take a few minutes to create and the summary and charting features allow us to do a quick analysis with just a few clicks. Gmail has also been a huge benefit to StraighterLine. Students can easily get in touch with us through Gmail and chat, allowing them to get help and continue learning in seconds rather than hours. At StraighterLine we’re happy to say we’ve gone Google!